From Zombieland to Scooby Doo to Silent Hill 3, movies, TV shows and games love to incorporate abandoned amusement parks into the storylines because they are inherently creepy. The haunting silence in a place that should be filled with laughter and chatter just seems wrong and, of course, if a ride does happen to move when it’s not supposed to, that’s when you know things are really going to end badly. But abandoned amusement parks aren’t just found in works of fiction. Here are some truly creepy and completely real theme parks that have been left to nature’s devices. 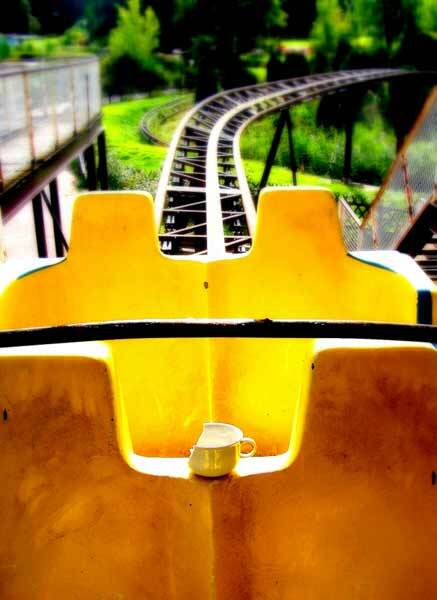 At one point, Joyland was the largest amusement park in Kansas, but 55 years after its opening, it was no longer profitable, largely due to the extensive number of repairs the rides needed to stay safe, and the park had to close in 2004. Joyland had over 24 working amusement rides, including one of the last wooden roller coasters. Unfortunately, the “Nightmare” as it was called actually took a worker’s life in 1999 when he was gardening too close to the tracks and was hit by the train. While that was the only recorded fatality at the park, it wasn’t the only accident. In 2004, a girl fell from the Ferris wheel when her seat’s safety bar became unattached and she reached forward to grab it. Of course, if movies and TV shows featuring abandoned amusement parks have taught us anything, I think we all know that the girl didn’t survive the fall, that the company bought off her parents to cover up the accident, and that her restless spirit haunts the grounds –owing, in part, to the park’s ultimate closure. As creepy all of the parks on this list look, this is one most likely to be haunted. That’s because two people actually died here due to faulty equipment. One of the most popular attractions was the duck-themed coaster. When someone died on the ride in the mid-1990’s, their family received no compensation or apology from the park, and the ride continued to operate –Korea is much more lax about this sort of thing than the U.S. When almost the exact same accident occurred in 1999, the park owner knew he could be in trouble, so he disappeared overnight, once again leaving the family with no compensation or apology. Soon after, the park was declared unsafe and closed. Creepily, the cart where the second victim died remained in the same place for years, hanging just off the edge of the ride’s tracks as a horrific reminder of what happened on that spot. Over ten years after the park was closed, it was finally demolished last year and there are plans to build a hotel on the site. One of the most famous and spooky of all abandoned amusement parks is Pripyat Park in Ukraine. Of course, the tiny amusement park only had about four rides, so really most people never would have heard of the park were it not for the Chernobyl disaster. The park was scheduled to open on May 1, but when the melt down occurred on April 27, it was opened early to entertain the children prior to the citywide evacuation notice. The few hours prior to the evacuation were the entirety of the park’s time in operation. These days, the only visitors to the park are the adventure tourists who go exploring the Chernobyl disaster zone. While the radiation in the area is mostly down to a safe level these days, the areas where moss has built up in the park have some of the highest radiation levels in the entire city. Those of you who want to check out the park without risking radiation exposure can see it in the movie Chernobyl Diaries and in the video games Call of Duty 4 and S.T.A.L.K.E.R. : Shadow of Chernobyl. While you may not have heard of Rocky Point, it was once one of the finest amusement parks in America and it even managed to stay in operation for over 150 years from its original opening in 1840. By 1996 though, the park was suffering from financial difficulties though and finally closed its doors forever. While some of the park’s rides were sold off to other parks, most of the attractions remain at the park, which suffered from a number of fires, many started by arsonists, since the park’s closure. For years, the main visitors to the park were urban explorers, vandals and arsonists, but last year half of the grounds were cleared and opened as a city park and the entire grounds will soon be transformed into a state park. Earlier this year, the city finally approved plans to turn the property into a 400,000 square foot outlet mall and entertainment boardwalk, so the desolate merchandise shops and rusty coasters will soon be just a distant memory of the destruction of Hurricane Katrina. Originally, little more than a picnic ground and beach, Chippewa Lake Park really hit its mark when it added a rollercoaster and a steam boat, transitioning the attraction into an amusement park. When the coaster first opened up in 1978, the coaster had to be manually pushed up the track after each ride. The park was a hit for a long time, but by the late sixties, attendance started to decline. The attraction was purchased by a new company that planned to turn the park into a summer resort, but the company couldn’t garner enough public interest or funding, so the plan was scrapped. One hundred years after Chippewa Lake Park opened, it closed for good with little fanfare. Urban explorers visiting the park are still treated with memories of the park’s big centennial celebration including cups and napkins from the big party. Since the park closed, it has remained largely left alone over the past thirty years. Photographers and vandals have come and gone, a few fires have taken down some of the buildings and the horror film Closed For the Season shot several scenes on the grounds, but many of the park’s structures still remain. Adding to the creepy factor is the fact that the former owner of the park requested his body be buried on the grounds when he died. His family upheld his wishes, but did not mark the gravesite, so no one but the family members know exactly where his body is located. Originally opened in 1969 as Kulturpark Plänterwald, Spreepark was one of only a handful of amusement parks in the communist German Democratic Republic. At its peak, the park attracted up to 1.5 million visitors per year, but by 1999, that number dropped to 400,000. In 2002, the park was closed for financial reasons. All the attractions remain onsite, crumbling and falling victim to Mother Nature. One of the scenes of the movie Hannawas shot at Spreepark, but other than that, the only visitors the park sees are trespassers hoping to snap a photo of the peeling Viking ship, the collapsing coaster and the collapsing dinosaur statues. While it’s not all that surprising that an amusement park centered around a giant statue of Gulliver didn’t survive, it’s not for the reasons you’d probably imagine. Sure, the lack of rides (the closest thing the park offered to rides were a bobsled track and a luge course) and overall boringness of the actual park probably didn’t help, but what really did this park in was its location –and I don’t mean its proximity to the lovely Mount Fuji. Gulliver’s Kingdom was located between Aokigarah and Kamikuishiki, two areas that have some of the most disturbing reputations in all of Japan. Aokigarah is better known to Westerners as “the suicide forest,” where around 100 people take their lives every year and annual body searches are necessary to clear the area of all the corpses. Kamikuishiki was home to the Aum Shinriyko doomsday cult that was responsible for the 1995 Sarin gas attacks on the Tokyo subway that left 13 people dead. Aside from the ghastly reputation of Kamikuishiki, the village was plagued with the residual smell of the cult’s nerve gas factory for up to five years after the factories were closed up –and the smell wafted all the way over to Gulliver’s Kingdom. So just imagine taking your kids to an area located between two of the creepiest places you can imagine only to hang out in a place that still smells like a nerve gas factory –doesn’t sound like a great family vacation in the making, does it? Unsurprisingly, the park was only open for four years and less than ten years after its creation, it was demolished. I don’t know about you guys, but I’ve always been fairly fascinated by abandoned amusement parks since I used to watch Scooby Doo. When our local amusement park closed down when I was about 12, I always wanted to go check it out, but never got the chance. Have any of you ever visited an abandoned amusement park? If so, was it creepy, cool or just kind of boring? Kendall Anderson's Abandoned Places Photos. Definitely one of the more interesting posts I've seen on Neatorama.